expert handicapper. Guaranteed. SIGNUP NOW! BREAKING: 20 tracks want to end race-day Lasix, Mike Smith picks Omaha Beach. We recap the Oaklawn Handicap, Lexington Stakes and Arkansas Derby. The prep races are done and so now it's time to start putting together our picks for the Derby. The Road to the Kentucky Derby ends today with the Arkansas Derby. Get our analysis. Guaranteed Tip Sheet named #1 tipsheet provider, Arkansas Derby Post Positions drawn. We recap the Wood Memorial, Blue Grass Stakes, Santa Anita Derby and more. Today we have 6 Radar Horses from our watchlist running. Read our thoughts on each one. It's GO or GO HOME time on the Road to the Kentucky Derby with today's big stakes. Santa Anita resumes, Keeneland opens, Wood Memorial field set and more. We recap the Dubai World Cup, Florida Derby, Gulfstream Park Mile and more. Today is filled with Stakes races from Tampa Bay to Santa Anita. See our preview. From the Dubai World Cup to Gulfstream's Florida Derby, we have you covered. Dubai World Cup post position draws, Golden Gate barn under quarantine and more. We recap everything from the Louisiana Derby to the Sunland Park Derby and more. Can WAR OF WILL make it 3 in a row in today's $1M G2 Louisiana Derby? See our thoughts. We added nine new horses to our RADAR watchlist from last week's races. Read our take. More drama at Santa Anita plus the Preakness moving to Laurel Park? Get the latest. We look at the Azeri, Essex and Rebel Stakes (Division I and II) from this weekend. It's the REBEL STAKES at Oaklawn Park and so we look at the track bias and identify winning trends. Santa Anita re-opens for workouts, Oaklawn Park splits Rebel Stakes and more. We recap the Gotham, Heavenly Prize and Tampa Bay Derby from the weekend. We break down The Heavenly Prize International being held at Aqueduct today. We look at two horses likely to punch their ticket to the 2019 Kentucky Derby. Santa Anita closed indefinitely plus Oaklawn may split the Rebel Stakes and Derby update. We review the Honey Fox, Davona Dale, Fountain of Youth and more from Gulfstream Park. Today's article looks at the three favorites heading into the 2019 Cheltenham Gold Cup. We look back at the stakes at Gulfstream, Sunland and Santa Anita from the past weekend. We follow-up our previous Horse Racing Roulette article to find the best wagering strategy. Jockey Victor Espinoza in back in the saddle, Woodbine Stakes schedule released, more. We decided to have some fun today by making some Presidential plays at Gulfstream Park. Derby qualifying races are in full swing with a likely guaranteed spot on the line today. NYRA announces exciting new Turf Triple Crown Series as Baffert reroutes Derby trainee. We take a closer look at Horse Racing Roulette to see if it's good bet or something to forget. We look at the San Vicente, Sam. F. Davis, and Las Virgenes Stakes from the past weekend. Tampa Bay Downs is the next stop on the Derby trail and so we take a look at the Sam F. Davis. This week we look at the KY DERBY standings, Keeneland's new W/P/S lotto game and more. We look at the Holy Bull, Withers, San Pasqual Stakes and more in today's recap. Today we look at the Busanda, Dania Beach and Sweetest Chant Stakes at AQ and GP. Today we cover 3 stops on the road to the Kentucky Derby including the HOLY BULL Stakes. Eclipse award winners, multiple track cancellations and more in our round-up. Things are heating up at SAM HOUSTON as we have two big stakes races on tap for today. PEGASUS CUP TIPS LIVE! We're on site with race-recaps, exclusive pictures, pick updates & more. PEGASUS CUP TIPS: It's time to pick a winner. ACCELERATE? Maybe not. Read our take. From DIVERSIFY's new trainer to who's up for Horse of the Year, get all of this week's top stories. We recap the Sunshine Millions, Astra and Lecomte Stakes in our weekend recap. PEGASUS CUP TIPS: McKinzie's out and oddsmakers say it's now a two-horse race. Today is all about prepping for the Pegasus World Cup, Kentucky Derby and Oaks. McKinzine now doubtful for Pegasus, Churchill purchases Presque Isle and more from this week. We take our first look at this year's Derby Contenders and the long road ahead to May 4th. Get today's picks and analysis of the Tropical Turf and Marshua's River Stakes at Gulfstream. PEGASUS CUP TIPS: We look at previous winners to see which current entries fit the profile. Pegasus Cup news, Abel Tasman sells for $5M, Derby Trail contenders and more. Our weekend recap of the Mucho Macho, Sham, San Gabriel, San Ynez Stakes and more. Today we break down the Santa Ynez Stakes as we look ahead to the Kentucky Oaks. Our focus today is on the $200K G2 SAN GABRIEL Stakes being run at Santa Anita. Picks + Analysis. PEGASUS CUP TIPS: Today we look at eight pre-race favorites and their previous efforts. Today we break down the Bay Ridge Stakes horse by horse to find a winner and maybe some value. Today we take a closer look at the Robert J. Frankel and American Oaks at Santa Anita. It's Super Santa Saturday at Fair Grounds and we give our analysis and picks. Up your handicapping game with our BIAS report as we focus on Aqueduct & Gulfstream. We look at the week's biggest stories heading into the Christmas holiday. We look back at the weekend's biggest races from Gulfstream Park to Remington Park. Gulfstream Park has a great string of races on tap with the return of FL Derby Winner Audible. We recap the weekend's big stakes races at Los Alamitos and Fair Grounds. We fell in love with Dutch wagering so we built our own calculator and then put it to the test. We recap the weekend's Cigar Mile as well as Gulfstream's Claiming Crown races. Today marks the return of racing at Gulfstream Park with their $1M Claiming Crown races. We review the week's biggest stories including the KJC upset, firing of SA announcer M. Wrona and more. On Nov 20th, legendary jockey Gary Stevens announced his retirement after an injury at Del Mar. Mountaineer, Golden Gate and Woodbine face closures for unusual reasons. We investigate. Oaklawn announces new hotel and event center, expands gaming and adds 3 weeks to racing season. A slow Sunday allows us time to break down and analyze today's Cary Grant Stakes at Del Mar. The slow weekend of racing is headlined by stakes at AQ and DM honoring icons. We review the week's biggest stories including the launch of our new redesigned mobile app. We take a look at our Radar Horses plus review key races and horses to watch at Aqueduct. Emerald Downs announced 2019 racing season plus a new track to New Mexico? Bob Baffert will train unraced son of TAPIT, COLISEUM for the Kentucky Derby. Plus KD Odds released. From Florida to New York, we recap the Gulfstream Millions and big stakes at Aqueduct. To all of you who have served and are currently serving, we stand and salute you. Get today's analysis. The south-Florida track hosts nine stakes races on Saturday's card, all of them with prize money of $75,000. To find more winning tickets, we evaluate early data from Aqueduct and Churchill Downs. With only 3 starts and one at the Breeders' Cup, is this filly ready for the Royal Ascot? Del Mar kicks off their latest racing meet on Friday and we are as ready as ever. With the Breeders' Cup behind us, we look ahead to the Pegasus and who might be vying for the big prize. Our Breeders's Cup coverage comes to a close with our recap of day two and us looking forward to next year. We're live blogging from today's Breeders' Cup with pics, picks, wagering guide updates and more. First time to the Breeders' Cup? Don't head out before reading this to get the most from your visit. Join in the fun of the new Head2Head wager and see which side of the pond comes out ahead. It's like Black Friday for horse players. We examine the opening BC Juvenile Turf Sprint. 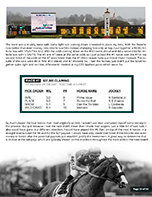 Our 15-page Breeders' Cup Guide is ready and here is a sample including two races. Less than a week until the Breeders' Cup we take a look at the Churchill Downs opening Stakes races. After 300 races, Belmont has finally shown her hand and you might be surprised by the results. It's the last weekend of racing before the BREEDERS' CUP and we look at the stakes from Belmont Park. We look back at Empire Showcase Day at Belmont and Maryland Million Day at Laurel. Today we take our first in-depth look at the contenders of the upcoming Breeders' Cup Classic. We take a look at the slew of graded stakes races at Belmont and see if we can find some winners in the bunch. Our recap of the $500K G1 Queen Elizabeth II, $200K Pebbles, $800K Pattison and more. Today we offer our take on the entire field running the $100K Point of Entry Stakes at Belmont Park. Our picks and analysis of the $500K Queen Elizabeth, $800K Pattison Canadian, $500K E.P. Taylor and more. Santa Anita has only been running for around 2 weeks but we examine those races to identify early BIAS. Our recap of the $1M Shadwell Turf Mile, $500K Claiborne, $400K First Lady, $500K Champagne & more. Our picks and analysis of the $500K G1 Flower Bowl, $400K G1 Frizette, $500K G1 Juddmonte Spinster and more. We analyze over 100 races at the latest Belmont Park meet to identify the track BIAS for each distance. Our recap of the Jockey Club Gold Cup, Joe Hirsch Turf, Vosburgh and Pilgrim Stakes. Our picks and analysis of the $300K Zenyatta Stakes, $200K Miss Grillo and $200K John Henry Turf Championship. Our picks and analysis of the $750K G1 Jockey Club Gold Cup and $500K G1 Joe Hirsch Turf Classic at Belmont. Our recap of the $1M PA DERBY, $1M Cotillion, $300K Kelso and $300K Charles Town Oaks. Our picks and analysis of the $300K Gallant Bloom, $125K John Hettinger and $125K Ashley T. Cole Stakes. Our picks and analysis of the $1M PA Derby, $1M Cotillion and $300K Gallant Bob Stakes from Parx. Our recap of the Woodbine Mile, Iroquoid and Pocahontas Stakes from Saturday. Our picks and analysis of Sunday's $250K G1 Natalma and $250K G1 Summer at Woodbine. Our picks and analysis on the Iroquois, Pocahontas and Woodbine Mile as we look towards the Breeders' Cup. Our recap of the big races on Saturday, including the heart-breaking KYD Juvenile Turf Sprint. Our picks and analysis of the big stakes races today at Kentucky Downs. including the $750K Turf Cup. As Saratoga closes, Belmont begins. Read about opening day and get our picks for the first Stakes. Our recap of the Woodward, Spinaway, Saranac and Del Mar Debutante with video replays. Our analysis of the $350K Hopeful, $300K Del Mar Futurity and more on this special Labor Day card. Our picks and analysis of the opening day Stakes races at Kentucky Downs for September 1st. The popular Jockey7 wager returns to Kentucky Downs for their meet beginning Saturday. We examine hundreds of races looking at wire-to-wire winners and what bias can get you to breakeven or better. Our recap of the Travers Day weekend features the $1.2M TRAVERS, Sword Dancer, Personal Ensign and more. Our picks and analysis for the Torrey Pines, Smart N Fancy, Soaring Free and Seaway Stakes. Our recap of the Pacific Classic, Alabama Stakes, Del Mar Handicap and Del Mar Oaks including replays. Our picks and analysis for the Del Mar Mile, Summer Colony and Sky Classic Stakes. Our picks and analysis of the Pacific Classic, Del Mar Handicap and Del Mar Oaks. Our analysis of the Del Mar meet to date looking at both turf and dirt bias for some patterns. Our picks and analysis of the Rancho Bernardo, Saratoga Special and Fasig-Tipton Ways. Our picks and analysis for the Arlington Million, Beverly D. and Fourstardave Stakes races. We look at some of our Radar Horses and why we think they have a shot in upcoming races. Our recap of the Whitney, Longines Test and Yellow Ribbon including analysis and race replays. Our analysis and picks for the Whitney Handicap, Yellow Ribbon and West Virginia Derby. We take a look at the top performing jockeys, trainer and more for the week ending July 29th. Our recap of the Haskell Invitational, Bing Crosy and Jim Dandy including analysis and replays. We give our picks and analysis of the Jim Dandy, Bing Crosby and other Stakes for Saturday. Opening day at Saratoga where many people have come to know it as the Graveyard of Favorites. That's how often our BEST BETS finish in the money on average. Some tracks perform at 80% or higher. Check out our new list of historical best bet percentages showing our averages for each track. Our BEST BETS are included with our tipsheets or may be purchased separately. We are now offering FREE HORSE RACING PICKS daily. Each day we will offer our entire tipsheet for a randomly chosen track with no purchase required. These are a few of our recent winning tipsheet payouts at various tracks around the country. See our full history. UNLIMITED TRACKS starting at $10! Wondering the best way to play our picks? 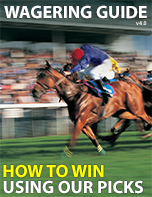 Get our 60-PAGE WAGERING GUIDE that features multiple real-world examples and scenarios, betting advice on our BEST BETS, tipsheets and much more. Any user with a valid PRO bulk subscription may get the guide for FREE from our download page. We have KENTUCKY DERBY PICKS, OAKLAWN PARK PICKS, KEENELAND PICKS, SANTA ANITA PICKS and many more. * average payouts per race date. ©2009-2018 Kennaco Assets, LLC. All rights reserved. You must first register before purchasing tip sheets. Registration is quick and easy. -or- Forgot Username or Password? Please enter your email address to retrieve your username and password. After pressing SUBMIT, if your account is located, your details will be emailed to you. Be sure and check your SPAM folder if you do not receive it within 5 minutes. I understand that the MONEY BACK GUARANTEE applies only to the price of the tipsheets and not to any wagers made. Our refund policy only applies to individual daily purchases, not bulk or monthly plans.